The Capital Markets Union (CMU) is a plan of the European Commission that aims to create deeper and more integrated capital markets in the 28 Member States of the EU. The CMU is a new frontier of Europe’s single market. Its creation is a key element of the Investment Plan announced by the Juncker Commission in November 2014. With the CMU, the Commission will explore ways of reducing fragmentation in financial markets, diversifying financing sources, strengthening cross border capital flows and improving access to finance for businesses, particularly SMEs. The European Commission will host a public hearing on the “Next steps to build a Capital Markets Union” in Brussels on Monday, 8 June 2015. The conference will be the first high-level public event after the end of the public consultation on the Commission Green Paper. 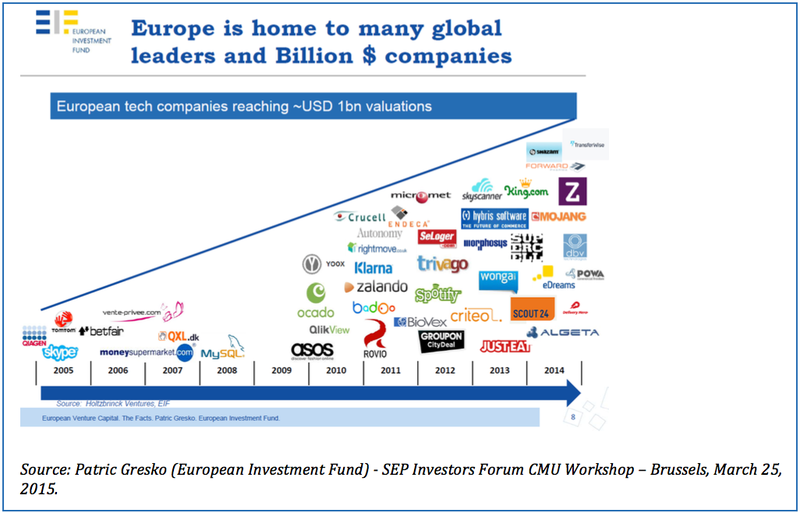 Startup Europe Patrnership – based on the outcomes of the SEP Investors Forum Workshop: “EU Capital Markets Union” organized in Brussels on March 25, 2015 together with DG FISMA and DG CONNECT – has submitted to the European Commission on April 30th the SEP Policy Report “Towards the EU Capital Markets Union. Venture Capital, Crowdfunding and Startups”. The SEP Policy Report includes data re: crowdfunding and venture capital as well as recommendations that could facilitate the access of European startups to capital, and the impact of such measures on the tech startup ecosystem. The culture of risk taking is still missing in Europe and that is an obstacle to the development of startups. Investors, banks, corporates focus too much on creditworthiness. More ambition, more experience and more risk-taking at the entrepreneur/startup level are required as well. There is a need for raising both financial and entrepreneurial education. This should target different audiences: corporates, policy makers, investors, entrepreneurs, financial analysts, etc. Some participants feel investors only bet on sure wins and short term profits, whereas they should invest more on ideas and talents and give startups more opportunities. The volume of funding is very low compared to the U.S., so startups cannot scale as much as they could and encounter problems to exit. This is ultimately a competitiveness issue and increases the risk of seeing “average startups” emerge rather than “scaleups” and “unicorns”. Tax regime, labor law differences, or cultural differences, etc., prevent European startups and investors to easily do business outside of their country of origin. Willingness to conduct business in the EU still means dealing with multiple regulations. That also prevents foreign money to enter the European market. Cross-border investments are seen by a participant as a “nightmare”, especially regarding crowdfunding. Regulations not creating a passport to invest smoothly in different EU countries. A Digital Single Market might help European companies to scale at the continental level, and a Capital Markets Union may attract foreign investments and help cross-border investments. Europe should make it easy for European and foreign LPs to invest in European funds (single taxation scheme), but also for European and foreign investors to invest in different countries. National countries with their local investment/incentives schemes encourage local investments and make it difficult to scale-up at the European level. Ultimately, regional policies and incentives do not favor the rise of European scaleups. In order to attract foreign money, communication campaigns are needed to make Europe look like an integrated whole, and show that the so-called Old Continent is open to business. Storytelling is complementary to reducing the regulatory burden on startups and investors.